Shapley's Magic Sheen 32 oz. Magic Sheen hair polish is a specially formulated silicone blend that produces maximum shine and a healthy mane, coat, and tail. It can be used on wet or dry hair to detangle and condition. 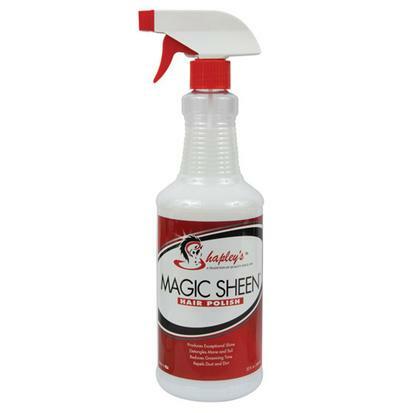 Magic Sheen will have your horse’s coat feeling like satin. Get all the advantages of original M-G-T with a new more pleasant light herbal scent. This product treats skin and hair conditions like treat rain rot, mud fever, dew poisoning, sweet itch, scratches, greasy heal, girth itch, itchy skin, dandruff and tail rubbing. It has even been reported to work on white line disease and thrush. This is a treatment you leave on the affected area without the need to rinse or wash between applications. The original formula that was created in 1938 is in this new plus formulation and it treats skin and hair issues with the same efficacy. M-T-G Plus creates optimal conditions for your horses’ hair and skin, leaving it soft and conditioned. Hair length and volume are significantly improved using this product. Get your horse’s mane and tail growing while treating many skin problems. M-T-G was originally developed to treat human skin conditions by a barber in 1938. Since then it has been used to successfully treat rain rot, mud fever, dew poisoning, sweet itch, scratches, greasy heal, girth itch, itchy skin, dandruff and tail rubbing. There are even reports it has worked on thrush and white line disease. M-T-G is not a shampoo, but a topical treatment you leave on the affected area. It eliminates what is creating the problem instead of just treating the symptoms. This time tested treatment conditions the skin and hair and creates optimal conditions for healthy skin and hair regrowth. 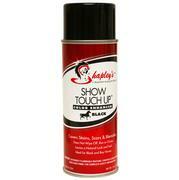 Shapley's Show Touch-Ups are color-enhancing sprays designed to safely and effectively conceal stains, scars, blemishes, and flaws. Colors: Black, Dark Brown, Medium Brown, Palomino, Sorrel, White.